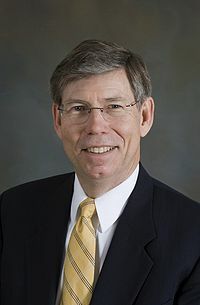 Ira William "Bill" McCollum (born July 12, 1944) is a conservative politician who served as the 36th attorney general of Florida. Bill McCollum previously served in the United States House of Representatives for 20 years. As a congressman, he was a strong supporter of the impeachment of Bill Clinton. As Florida's attorney general, he was a strong advocate of the protection of children, particularly against online predators. McCollum, along with the attorney general from South Carolina, announced plans to file a suit against the federal government for passing the healthcare reform bill. McCollum unsuccessfully ran for U.S. Senate in both 2000 and 2004 as well as sought the Republican nomination for governor of Florida in the 2010 election, losing to Rick Scott in the primary election. A native of Brooksville, Florida, McCollum attended Hernando High School, graduating in 1962, and earned both his bachelor's and law degrees from the University of Florida in Gainesville. He was admitted to the Florida bar in 1968. McCollum served 23 years in the U.S. Navy. He was on active duty from 1969 through 1972, and retired from the Naval Reserves in 1992, having attained the rank of Commander. His military career was spent in the Judge Advocate General’s Corps (JAG). McCollum stated that it is unconstitutional to require U.S. citizens to purchase health insurance.